Card games are played with a stack of cards. Aisleriot is a free game. This means that the source code is available to be studied, modified, and distributed. Most projects look for help with testing, documentation, graphics, etc., as well. Aisleriot is the official patience card game suite for the GNOME desktop. 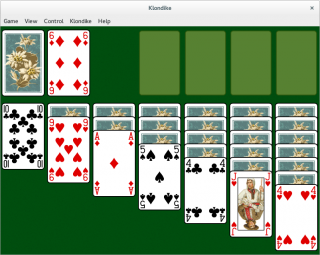 It comes with over 80 games including some of the most popular such as Freecell, Klondike, and Spider. The cards can be themed. Card Stories is a free game. This means that the source code is available to be studied, modified, and distributed. Most projects look for help with testing, documentation, graphics, etc., as well. Card Stories is an online multiplayer HTML5 based game of cards that promotes creativity and imagination. It is developed by Farsides and released under the GNU Affero General Public License. In 2013 it was awarded a Notable Entry Runner-Up award at the Mozilla Game On competition. Deer Portal is a free game. This means that the source code is available to be studied, modified, and distributed. Most projects look for help with testing, documentation, graphics, etc., as well. Deer Portal is a hybrid board/card game for four players driven by the four classical elements. The game takes place in an ancient world where the Almighty Deer God is protecting all the compassionate creatures. 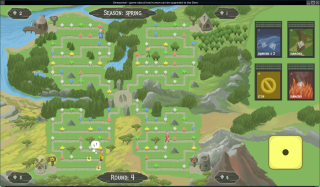 GNOME Games or GNOME Games Collection was a collection of sixteen small games in a variety of styles and genres for the GNOME desktop (similar to KDE Games and Simon Tatham's Portable Puzzle Collection). As of GNOME 3.8 the games were separated into individual packages and the collection doesn't exist anymore. Gnome Hearts is a free game. This means that the source code is available to be studied, modified, and distributed. Most projects look for help with testing, documentation, graphics, etc., as well. 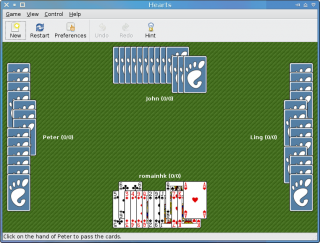 Gnome hearts is "an implementation of the classic hearts card game for the GNOME desktop" written in Python. The latest version of the game is version 0.3 released on July 24th, 2008. JSkat is a free game. This means that the source code is available to be studied, modified, and distributed. Most projects look for help with testing, documentation, graphics, etc., as well. 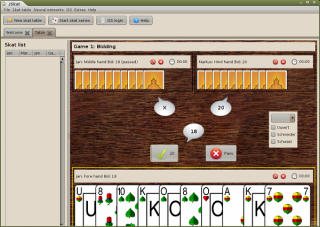 JSkat is an implementation of the German card game Skat and variations thereof. Players can compete with fellow humans or with the computer. JSkat is implemented in Java. KDE Games Please add the Gameinfo template to the article KDE Games is a division of the KDE project, creating a collection of quality games for KDE desktop. It is similar to GNOME Games and Simon Tatham's Portable Puzzle Collection. Most games are distributed under GPLv2. NetMauMau is a free game. This means that the source code is available to be studied, modified, and distributed. Most projects look for help with testing, documentation, graphics, etc., as well. 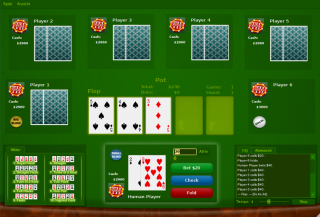 NetMauMau is an online version of the multiplayer card game Mau Mau. Mau Mau is a game with some similarities to Uno. PokerTH is a free game. This means that the source code is available to be studied, modified, and distributed. Most projects look for help with testing, documentation, graphics, etc., as well. 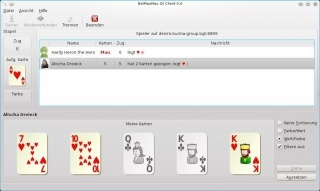 PokerTH is a Texas Hold 'Em Poker card game with network support, translations, and many other features. It is licensed under the GPLv2. It used the SDL library. Card games is a free game. This means that the source code is available to be studied, modified, and distributed. Most projects look for help with testing, documentation, graphics, etc., as well. 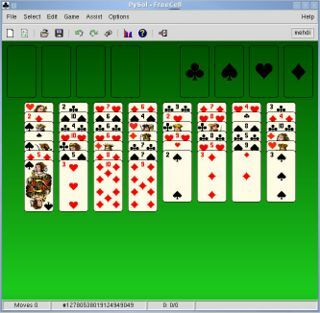 PySol (Python Solitaire) is a package of 200 solitaire card games. The software is now discontinued, but the fork PySolFC exists. This page was last edited on 7 January 2019, at 17:56.